Glaucoma is the leading cause of blindness in the United States. Early detection can save your sight, and left untreated, glaucoma can and does lead to total blindness. Glaucoma is a disease of the eye characterized by elevated pressure inside the eye and sometimes other factors that cause the fibers running through the optic nerve to slowly deteriorate. The optic nerve is the part of the eye that carries the images we see to the brain. While glaucoma initially causes no symptoms, it eventually progresses to a subtle loss of side vision (peripheral vision). There are many different types of glaucoma. They are typically be classified as either open-angle glaucoma, which are chronic conditions, or closed-angle glaucoma, in which the condition appears suddenly. Most glaucomas usually affect both eyes, but the disease can progress more rapidly in one eye than in the other. Involvement of just one eye occurs only when the glaucoma is brought on by factors such as a prior injury, inflammation, or the use of steroids in that eye. There are different types of glaucoma and most patients have no symptoms until the disease is far advanced. The good news is that all are detectable and treatable through proper and regular eye examinations. An ophthalmologist can usually detect those individuals who are at risk for glaucoma before nerve damage occurs. Several painless tests that determine the intraocular pressure, the status of the optic nerve and drainage angle, and visual fields are used to diagnose glaucoma. Although nerve damage and visual loss from glaucoma cannot usually be reversed, glaucoma is a disease that can generally be controlled. Glaucoma treatment can normalize the intraocular pressure and prevent or retard further nerve damage and visual loss. Glaucoma treatment may involve the use of eye drops, pills (rarely), laser, or surgery. Glaucoma is a lifelong disease. Regular visits to the eye doctor and adhering to the prescribed medication regimen offer the best chance for maintaining vision. 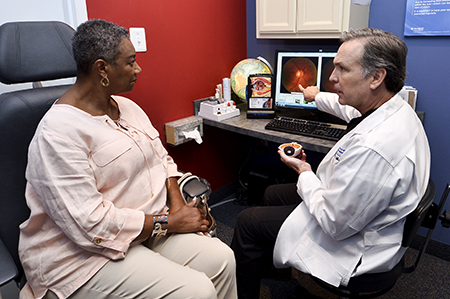 Advancements in technology, medication and surgical procedures are helping to slow or prevent further vision loss. New eye drops will continue to become available for the treatment of glaucoma, including ones that are easier to take and cheaper. In other studies, new surgical methods are being evaluated to lower the intraocular pressure more safely without significant risk of damage to the eye or loss of vision. To assess your risk for glaucoma, visit the American Academy of Ophthalmology’s website at www.eyecareamerica.org. Want to learn more? Check out these Glaucoma FAQs.